Hannah prepared a PowerPoint presentation on Roth IRAs for Kids, which she uses at programs and meetings involving adults and older kids. You have permission to download the presentation and use it for instructional purposes at meetings and programs on this subject. Please, encourage persons in attendance at those meetings and programs to visit www.IRAKids.com for additional information. 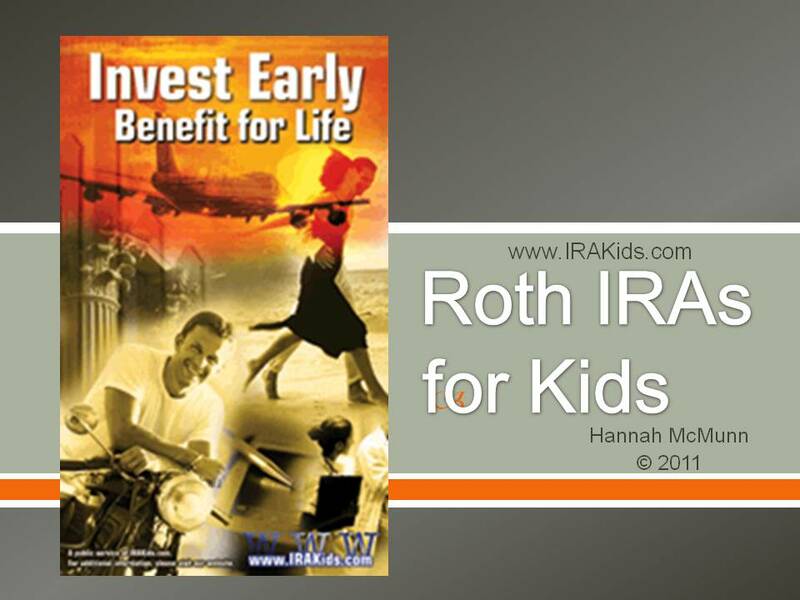 Download Hannah�s PowerPoint presentation on Roth IRAs for Kids. "Hannah, your PowerPoint presentation on Roth IRAs for Kids is so refreshing -- the best I have seen. And to be created by a student for students is a wonderful thing. Will you please contribute it to the Jump$tart Clearinghouse, where it can be used by professional financial literacy educators throughout the United States. Your presentation is an exceptional resource, and it will help educators everywhere to teach kids about the benefits of Roth IRAs." -- Rosella Bannister, Director Emeritus, National Institute for Consumer Education at Eastern Michigan University, and consultant to the Jump$tart Clearinghouse.